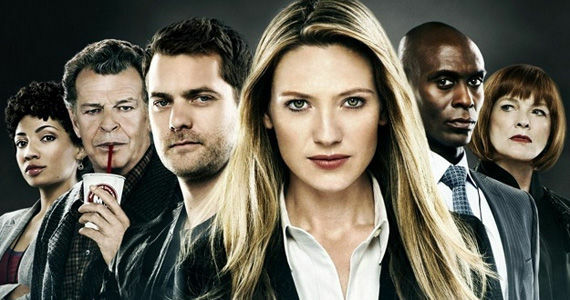 After five seasons, two universes, and multiple timelines, Fringe ended its run January 18, 2013 on Fox. I’m proud to say I stuck with this show to the very end. More than anything – like other fans – I connected with the cast’s phenomenal performances. When the sci-fi was good, the show was great. When there was more “fi” than “sci,” the actors buoyed the show to the next peculiar portal. For those unfamiliar with Fringe, it follows a team of FBI investigators in the “Fringe Division.” Not unlike The X-Files, Fringe had a case-of-the-week structure with a dense, over-arching mythology spawned from most of the cases. At the heart of the mythology was the story of Walter (John Noble) and Peter Bishop (Joshua Jackson), an estranged father and son who – with the help of FBI agent Olivia Dunham (Anna Torv) – grew to love each other. Add lab assistant Junior FBI Agent Astro…I mean, Astrid Farnsworth (Jasika Nicole), and Special Agent-in-charge Phillip Broyles (Lance Reddick), and you have the Fringe team. Nina Sharp (Blair Brown), COO of Massive Dynamic, a corporate entity frequently responsible for the bizarre events the team examined, often aided the team in their investigations. Oh yeah. And bald man who wore a suit and fedora observed them. His name was September (Michael Cerveris). Now that the show is over, I decided to compile as many of its transmedia extensions as I could in one place. Like Lost, another J.J. Abrams production, Fringe created a rich storyworld in which fans delighted throughout its five seasons. From viral videos and comic books to Easter eggs and science education, Fringe stretched its tentacles around numerous platforms. I’ve done my best to keep story descriptions vague and spoilers to a minimum; however, there are a few. If you wish to keep completely in the dark, proceed no further. And watch the show. Let me start at the end. My impetus to create this compilation grew after I learned Bad Robot, J.J. Abrams’ company which produced Fringe, is publishing a book from the show. 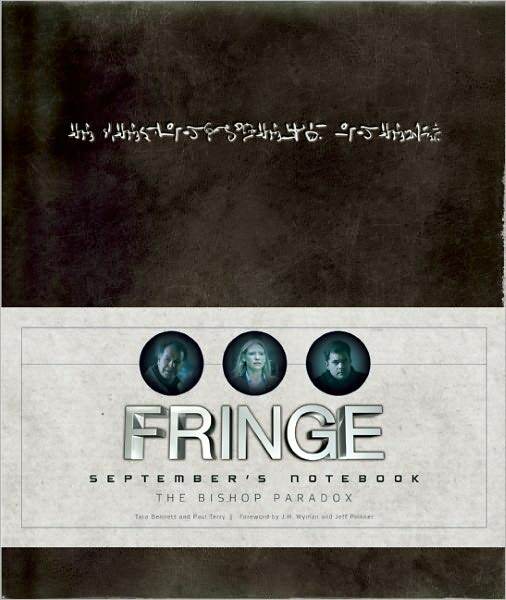 Unlike the “The Lost Encyclopedia,” a post-show summary book about another Bad Robot production, Lost, “September’s Notebook” actually appeared in episodes of Fringe. Throughout the series, a group of twelve bald men took notes about Earth’s history. Named after months of the year, the one called September followed the Fringe team, detailing their every move in a notebook and gradually becoming more attached to them. The Observers were an enigmatic element in Fringe’s mythology, and Fox harnessed that mystique in marketing campaigns, both commercially and virally. Fringebloggers.com has a great history of the Observers’ appearances. The most exciting facet of the notebook is that it isn’t just a translation of September’s writings. The book includes artifacts September collected and placed inside for safe keeping. The authors are attempting to put the fan in September’s shoes. Touch what the characters touched. Feel what they felt. It is a tactile and interactive augmentation on what fans have already seen to give context to the series. Fringe’s showrunners always tried to honor the feedback their fans offered. After the backlash from the Lost series finale, it felt as though Fringe creators didn’t want a repeat of last time. With the notebook, they’re attempting to thank fans from all over the world by treating them as Easter Eggs. Fans that used #FringeFridays on Twitter get a special shout out in the book. That is how you connect with fans. Listen to them and speak with them – not at them. Fringe fans have changed how social media affects the longevity of a show. “September’s Notebook” is a way to thank them for going above and beyond. One of the more controversial aspects of the show is the Observer language. Initially created by actor Michael Cerveris, who played September, Fringe eventually imbued the random symbols he scribbled with meaning. The producers frame “September’s Notebook: The Bishop Paradox” as a translation of the language written in the notebook. Fringe fan Drew Crawford wrote a nice post on his disappointment of discovering that many of the Observer words are gibberish; however, the symbols are still a fun frill on the Fringe mythology. You can even download “The Observer” font at Dafont.com. 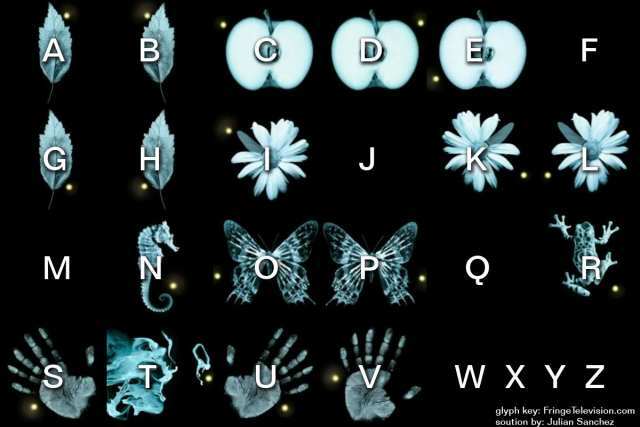 One of the first big Easter eggs Fringe disseminated to viewers starting with the first episode was the glyph cipher. The glyphs appeared leading into each commercial break. Each had a variation of a glowing yellow dot in one of the picture’s four corners. It took the better part of the first season for someone to decipher the code, and Julian Sanchez was the guy who did it. Each glyph corresponded to a letter of the English alphabet, and together, the letters spelled a word that corresponded to a character or a theme related to that episode. To prepare its audience for the drastic shift in tone of season five, Fringe released a series of public service announcements…er, warnings…from The Observers. They directed fans to the now defunct rewardwire.org, where they could engage with the story. The videos also included the hashtag #AreYouDonald?, a reference to an unknown ally of the resistance, and who the Fringe team sought for most of season five. Before the pilot even aired, Bad Robot created content to prep their new science fiction series. 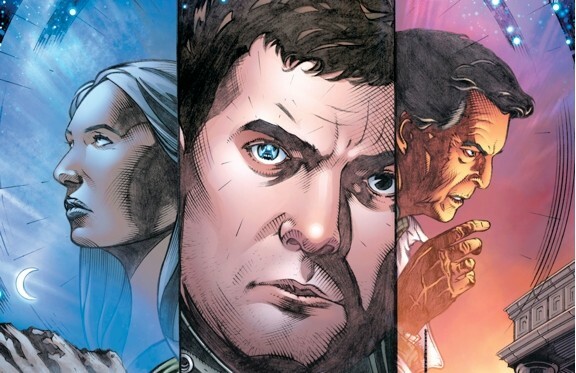 The “Fringe Preview Comic” is the prequel to a six-part Fringe comic book series that cover stories prior to the series’ pilot. From WildStorm Productions, they distributed it for free at San Diego Comic-Con in July 2008. The second series of comics “Tales from the Fringe,” was a six-issue miniseries that featured a different main character on the show that added to the show’s mythology. The third installment did something unique. The producers let Joshua Jackson – one of the show’s stars – write a series of comics. “Beyond the Fringe,” offered alternate universes not seen on the show. There were 12 individual chapters divided between six ‘A’ stories that tied directly to the show storyline and six ‘B’ stories postulate a ‘what-if’ tale. The ‘what-if’ tale even goes as far as to make Peter (Jackson’s character) into a superhero who protects the citizens of “Boston City.” For real. 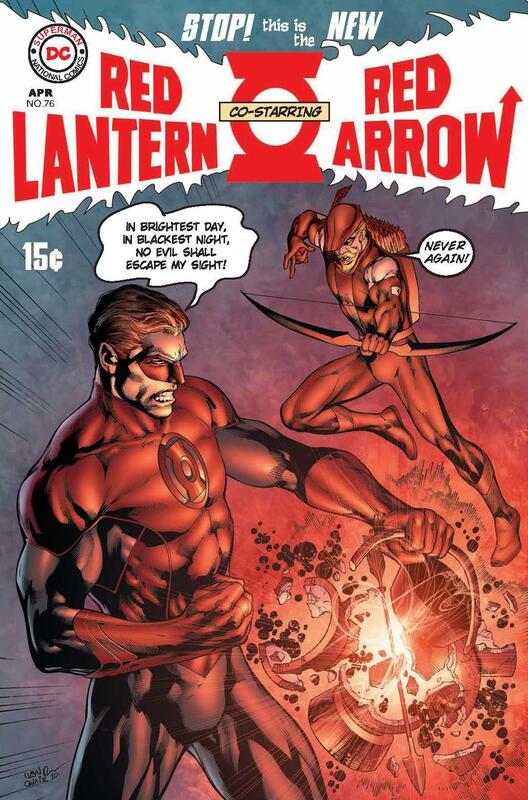 One other trivia tidbit I enjoy: DC Comics published the second and third volumes, and the show carried over a shout out to its red alternate universe storyline on television, in which the “Red Lantern” and “Red Arrow” are DC comic characters. One of the lesser known aspects of Fringe is its partnership with the non-profit organization Science Olympiad during seasons 2-4 in which they offered lesson plans for science teachers. “The Science of Fringe” inspired lessons that use the episodes to teach about hard science. You can download lesson plans here. Several seeds planted the series back in 2008. The Massive Dynamic website of the fictional, monolithic corporation that touches everything in the Fringe universe is still up and running. It offers a peek inside this probably sinister company, including mock press releases you can download. It also led to an ARG that Jonathan Waite covered on ARGNet. Fringe launched a scavenger hunt at the 2008 Comic-Con in San Diego, and an online sweepstakes began at the now dead, imaginetheimpossibilities.com. Fringepedia.net. has a detailed list of all the rabbit holes. In January 2013, Jensen Carp of Gallery 1988 curated the “Fringe Benefits” exhibition. Known for showing art inspired by television shows, like Breaking Bad. With “Fringe Benefits” co-creator J.J. Abrams and his team asked viewers to judge 31 episodes. The top six episodes acted as inspiration for artists to create work. Limited edition prints were sold online, and proceeds went to The Mission Continues, which awards community service fellowships to post-9/11 veterans. Fan favorites are sold out, but a couple prints are still available. One of the best things about Fringe was its sense of humor. Typically, Dr. Walter Bishop was the character tickling ribs. Having lost his mind and lived in a St. Claire’s Mental Institution for 17 years, his wild perspective was always fodder for fun. Also, his frequent LSD and THC trips made for some of the series most imaginative and goofy episodes. At the foundation of all these bits and pieces is a great television show. If you haven’t checked it out, you can watch the entire series through Amazon. The fifth and final season DVD drops on May 7, 2013. Pre-order it here. Amazon Prime also has Fringe Seasons 1 through 4 to stream online at Amazon Instant Video. If you’re a Netflixer, you can get disks mailed to your house. I’m sure I missed something. Over five seasons, there have been tons of bread crumbs scattered across the Internet and real life. If you know an aspect of Fringe‘s transmedia swell I missed, please sound off in the comments. I must thank all the sites dedicated to this now classic television show. They archived tons – tirelessly writing, recording podcasts and observing Observers in the background of scenes – for five seasons. Kudos for your devotion. I enjoyed your commentary nearly as much as I did the show, itself.